Back up to 22 people again this week. So close to breaking our attendance record! Maybe February is the month it'll happen. Only time will tell. Everyone loves a bargain, right? And everyone loves a board game. 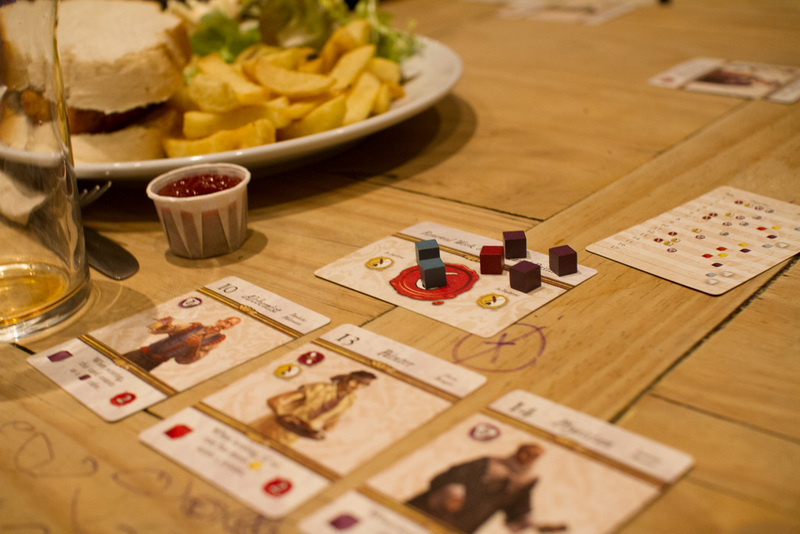 So everyone must love a board game bargain. I managed to pick up a game with a tenner off because of a dented box. I'm living the actual dream! As hinted at by the title of this blog post the game was Gold West, a lovely little euro game. It's as if Stefan Feld made Kingdom Builder. It was touch and go towards the end of the game and I thought Johnny was going to come first but I managed to take pole position. It seem like, although we had a lot of people, only a few of them brought games this week. One group played pretty much entirely fillers. Rattus Cartus though which I would say it almost out of filler territory. They started with Timeline and went on to play Patronize, Sushi Go and Eight Minute Empire. Afterwards I joined them for Biblios (Dan won, I was the only player to get no points at all) and Flip City (Matt won). Danny recently acquired Mafia de Cuba which made its IpBoG debut this week. I also saw him playing Chinatown which is no surprise, he plays it almost every week. It must be close to hitting the top spot of most played game at IpBoG. Although the top two are currently Coup and Skull, both of which Phillip played today. 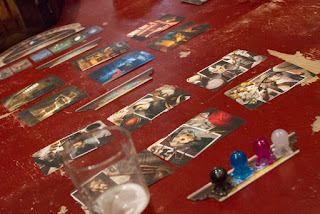 I saw a group playing Dixit followed by the Dixit-like Mysterium and another group playing Spy Fall. I'm sure I must have missed a couple of games but there were so many it was extra hard to keep track this week.